Model-Train Room | Habitat | Kids VT - small people, big ideas! The memory of a broken toy train from childhood spurred Paul Bortz to start collecting model trains. The exact model, a 1925 Lionel, was one of the first trains he purchased five years ago. "I went back to my childhood after I retired," explains the 72-year-old former reverend. 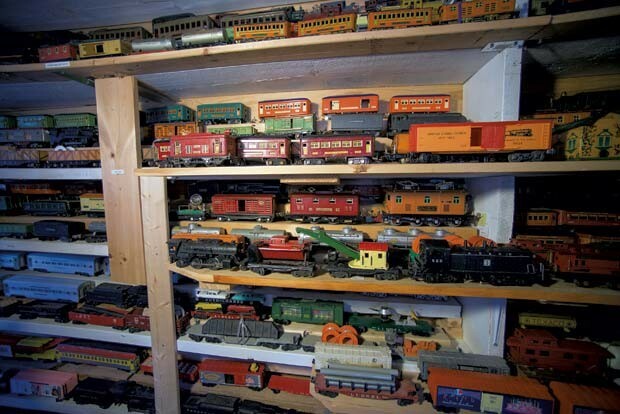 A father of five and grandfather of 14, he has since amassed more than 800 train cars. Bortz has so many, in fact, that he built a special room on the second floor of his home in Ripton to contain them. A large, carpet-covered table fills most of the space; on it are four train setups, as well as a variety of miniature houses, stores and people. Bortz turns the dial of a transformer, and the electric cars come to life, rounding the tracks slowly at first, then picking up speed. As they snake around the curves, they make chugga-chugga sounds, and a conductor barks announcements. 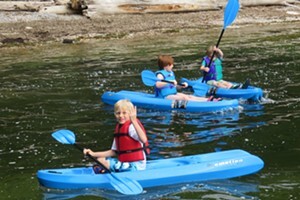 Bortz's grandchildren, many of whom live nearby, love to play in the train room when they visit. The last time his 5-year-old granddaughter, Addie, was there, she spent an hour sitting atop the large table repositioning the figurines and buildings. "She arranges it in the way she wants it, completely different than the way I would want it," he says, chuckling. Bortz displays many of his trains — according to the year they were manufactured — on floor-to-ceiling bookshelves. He customized the shelves by adding wooden pieces to accommodate the cars. Bortz's collection includes trains manufactured as far back as 1906, as well as present-day models. Notable trains in his collection include Unique Art brand cars, which were only manufactured between 1949 and 1951; gang cars, which change directions when they bump into something; and a dark red 1995 Lionel that emanates smoke.